As with all the elites for the Mastery quests, he leads a bunch of his kind. Don't worry, they won't add. Check around that whole area north of the Oshu'Gun area... we wanders pretty far. Easily soloable for most Druids, Shamans and Paladins. Slow-swinging, moderate damage (About 300 on 17k armor). Stuns around once a minute. To all hunters out there, he's kiteable. Pop on Aspect of the Cheetah and you're golden. Warlocks: Wait until he paths close to Forge Camp Fear, enslave the 68 elite, down him. I'm UA specced and I dumped all my DOTs on it and it never lost aggro. Did the same thing with the two other Nesingwary Elites, never had a problem. Loot, put the demon on stay, and ta-da. Soloed as a 66 feral druid. Soloed as a 68 shaman - made my earth elemental do all the tanking. He's immune to frost slowing effects, so not kiteable by a frost mage. Bummer! kiting him awhile back as an arcane mage. Still kitable as a mage. Did it at level 68, specced 40/0/19. Easier with mage armor instead of molten armor. Mana regen is more important than the crits. Pulled with a trinketed frostbolt, then popped ice lance as I ran. Blew trinkets/arcane power as they were available. Used fireblast when clearcasting procced, and blinked as soon as it's available. MAKE SURE YOU BLINK THE WAY YOU'RE INTENDING TO KITE. Messed this one up a few times by blinking sideways while I was running sideways casting ice lance. He has less space to catch up to you if you don't blink straight ahead. Best spots to kite him around are the road north of Oshu'gun, and the clear field area just south of the road. If you just can't get this to work, he's easily pulled over to Telaar, just like Durn. The guards will kill him in seconds, though, so make sure you've done enough damage to get kill credit. Immune to entangling roots and he runs a bit slower than 40%. Was barely able to escape from him by travel form. Shadow priests: This is barely soloable if you're prepared to use a healing potion. Just burn him down and keep shield up as much you can. Shadowfiend helps as well. Random, but is Banthar's name a reference to the Banthas in Star Wars? They're also pack animals of similar size, with long shaggy fur. the same procedure for all the 2-man-quests at nesingwary's camp. I tried kiting him twice today and killing him near sunspring post, he bugged out twice, I couldn't loot him. I petitioned a GM and in a not very pleasant conversation he told me not to kite it. "Kiting in general is a bad idea because it can looting issues with the mob not dying in it's spawn area"
So I decided to kite him within his spawn area, around the oshu'gun area and this time I was able to loot it. So kiting is fine, just don't take the mob too far away from it's spawn area. Easy fight with a 69 prot pally and 67 fire mage. Another easy quest soloable with a warlock. Make your way to one of the Forge camps, curse of shadow and enslave a felguard over there, then mount up and run over to where she is and kill em, you won't need to do much, just DoT em up. Easy to kite as a hunter. Best way to do it is to put on Aspect of the Cheetah, pull him to the road, and keep kiting him to Telaar. ALWAYS keep applying Serpent Sting, preferably a few seconds before it's about to fade off him. I found running sideways (strafe with the Q and E key) allows me to still hit him while running. Also just done as a 67 FR Mage, using the above tricks, he barely hit me, I had to drink 1 Pot and my pet was alive at the end. Great Strat pinkerton!! I could not solo this guy as a 68 BM hunter, despite 3 attempts. First attempt he 3-hit my cat and 2-hit me. Second attempt kited him to Telaar with Serpent Sting and Aimed Shot, but he evaded out on the doorstep of Telaar. Third attempt kited him again with Serpent Sting, Arcane Shot and Steady Shot, but still did so little damage that when the guards killed him I could not loot. This is as a 68 BM hunter with the 68-rank attack spells. So all you people above who reckon you soloed this mob at lower levels - screenshot or it didn't happen. This is definitely a group kill! Managed to solo as a 66 frost mage, but needed a health potion. I just kited him between myself and my frost elemental. pop the elemental and let it attack, go max range and start DPSing the boss and you will pull aggro, when he gets to you use ICE block which will stop him aggroing you and head back to you elemetal - when he gets back to your elemental start DPSing him again. Throw a cold snap get your elemental back up and do the same again and you should be able to get him down. Solod him with a lvl 66 feral druid. First cat form, Pounce, mangle, shred and maim. heal up and change to bear form and kill him from there. No one even bothered mentioning that the clefthooves around him attack you when you attack him. Update: How noobish of me. What made the clefthooves attack me was that I cast demoralizing roar. If you're a feral druid, take extra care before using it. Very easy kill as a 67 balance druid. Just kite him around dotting him up with insect swarm and moonfire then pop into travel form, couple sec before the dots wear off reapply them. You should have a large enough opening when you pull him so you can keep ahead of him and kite them. This may be difficult for those who are trying to kite him without keybinds and keyboard turning. Especially when trying to reapply moonfire, since you need to be infront of the target. anyone else sense a Star Wars reference here? Soloable by a level 70 BM hunter. You just have to remember to bring some mana potions (you ARE going to run out of mana) and keep your pet up. I popped Mend Pet frequently even if my pet wasn't lower than 25% health and he managed to hold on. Also used the Bestial Wrath, Bladefist's Breadth, Intimidate combo to get max hits in. All and all a pretty tough fight. Oh, and if you're just passing by on your dailies, do help others kill this beastie, many times it's very hard to find a group for him (at least on my server) and it won't take you long to help one guy out! Solod as a 67 feral druid. Had to stun to heal a few times, blew innervate, and frenzied regen, so I would say a fairly difficult fight but doable. Solo'd as a 68 lock. Affliction specced with haunt. Basically I send in the void walker and DoT him very lightly, and just use health funnel to keep the Voidy going. This works on all three Banthar, GutRipper, and Bach'elor. Soloed as a 65 frost mage. It was difficult but not as hard as Bach'lor. I didn't kite him at all. I just pulled with my water elemental and frostbolted after the water elemental got aggro. I used ice barrier, a spell power trinket, spell power elixirs, wizard oil, buff food, and a healing potion. Easiest of the three mastery quest beasts. Solo'ed with a 67 Prot Warr. Has some annoying "followers", not really "adds". 4-5 critters follow him around. When you attack from the front they continue to travel "though" him. As you attack Banthar you will inadvertantly attack them. Fight goes down hill from there. Advice: pull him to the side, away from the path the followers are travelling. Spammed Revenge and Shield Slam, had to use on major healing potion but prevailed in the end. He's fun to kite to Halaa. Don't loot or skin, just let the corpse sit there and rot to confuse people and make the lul. Easy soloed as 69 poor geared balance druid, just need to send treants on him, and spam starfire. Just killed him on my level 65 Shadow Priest. I kept all of my DoTs up - (SW:P, Devouring Plague..) during the whole fight and Vampiric Embrace to keep my HP up. Solo'd as a 65 Arms Warrior. Popped Retaliation and after 2 tries, finally downed him. I guess it boils down to some lucky parries and crits. Did 639 DPS over the course of the fight, left standing with 20% health. Soloed him with my 67 blood dk without any problems. Soloed as 64 feral druid, opened up with berserk > Pounce > Mangle > Rake > Maim then mangle spam, raked and a 5 CP Rip and kited him, went back to apply more bleeds and kited again, didn't even have to heal. Easily solod as a 65 demo lock. Simple tank n spank, not much to worry about except agro. 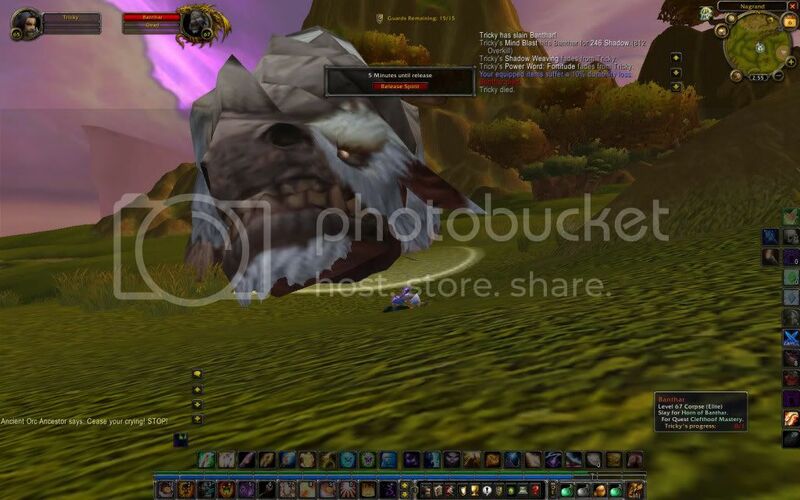 If you are a Warlock, you get SoulShatter at 66, wait until then and itll be a lot easier. Before 1000 bulls, elementals and void kill you. Solo'd as 65 enhancement sham. Just pop wolves once the battle starts and do shammy rage and all other cd's you have to make sure you win :P He didn't last the duration of wolves (45 seconds). it was a suprisingly easy fight all, i did was push some diseases on him and spammed death strike and heart strike. Do NOT try running around with him at the elekk place around 45,60. You'll end up getting tons of useless elephants on our back. Solo'd as 67 Unholy DK with my ghoul and used my gargoyle, horn of winter and bone shield. Got me down to 2k hp once but other than that was fine. Certainly not for resto shamans. Just soloed on my 65 Enh Shaman. Not tricky, pop wolves EARLY. That thing hits like a truck. Also, the clefthoofs behind her are neutral. Nothing to worry about. Banthar's old unique white model will now be used on the clefthooves in the Bone Wastes of Terokkar. There is some speculation that this change might mean that Blizz is planning on tameable clefthooves. Or blizz just decided "Meh....might as well use this model somewhere.....oops almost removed the white model from game! Better fix that!" If this beast is indeed named for the bantha beasts in Star Wars, the current coloring seems MUCH more appropriate as those beasts were also a reddish brown color. Immune to rogue stunning abilities like sap and kidney shot. Soloed as a 68 combat rogue with evasion and other survival things to keep up and outlast him. Failed the first time when a pesky wind elemental came too close and interfered, so wait for him to pat away from those. So much easier to solo than Durn der Nimmersatte! Soloed by a level 67 Fire Mage! The Wowhead map was super helpful on this one. I was flying all around the field trying to find it but not going far enough to the edges. Banthar will be hanging out along the edge of the north half of the field. It's been two days now and I haven't seen hide nor hair of Banthar, just some clefthoof calves, a few clefthoof bulls, a great number of normal clefthooves, and far too many players that killed without looting (thus making the corpses impossible to skin ¬.¬). But no Banthar. Dieser NPC befindet sich in Nagrand (32).